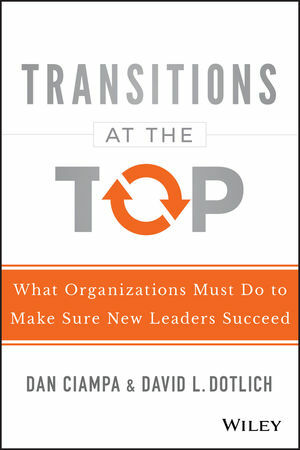 Transitions at the Top is an insightful, informative guide to navigating a change in leadership. A smooth transition is critical to both the health of the organization and the success of the new leader, but good planning and strong strategy can help organizations come out fresher and more driven on the other side. This book provides the specific principles, guidelines, and actions that boards, C-suite executives, and HR leaders need to guarantee a successful CEO transition. Continuity is key as one leader passes the mantle to a successor, and this book spans the steps and events that take place from when the candidate accepts the offer, all the way through the point where a critical mass of followers have accepted him or her as the established leader. Coverage includes guidance on who should be engaged in the process, as well as role-specific advice for each member of the transition management team. Many books have been written to advise new incoming CEOs, but there is little guidance available for the organization as a whole. This book provides actionable advice on smoothing the transition without breaking stride. The transition management team plays a crucial role in maintaining the health of the organization during a time of major change. Strong strategy becomes critical when an organization is in flux, and high engagement is key. Transitions at the Top provides expert insight, clear guidance, and a solid plan for a smoother transition. DAN CIAMPA is an advisor on CEO transitions, operations improvement, culture change, and top-level organization for implementing new strategies. He was chairman and CEO for Rath & Strong, Inc., and named by Businessweek as among the top five CEO advisors. He is author of four other books, including Right from the Start, with Michael Watkins. For more on his background, see www.danciampa.com. DAVID L. DOTLICH, PHD, is president of Pivot Leadership, a Korn Ferry company, and is an advisor and coach to CEOs and boards of companies such as Telstra, Johnson & Johnson, Nike, Ericsson, and DPDHL. He is an entrepreneur who has started, grown, and sold two large companies and is a former executive vice president of Honeywell International. He is the author of 12 books on leadership and has been named one of the Top 50 Coaches in the United States.